The Oslo Stock Exchange was having another bad day on Monday, with all its five most-traded shares falling once again. None dove as steeply as Norwegian Air, which was down nearly 14 percent by late afternoon, after falling more than 9 percent on Friday. British voters’ decision to leave the European Union (EU) set off the stock market dive that left Norwegian Air shares trading at just NOK 269 Monday afternoon, down 13.78 percent from their close on Friday. Statoil, DNB, Marine Harvest and Yara International were all taking another pounding as skittish markets continued to react to the so-called Brexit (British exit) vote announced Friday morning. The pound itself was trading at its lowest level against the US dollar for more than 30 years on Monday, and shares in British banks were suspended on Monday after they sank like a stone. The market turmoil is blamed mostly on all the uncertainty surrounding Britan’s withdrawal from the EU and what that will mean to trade agreements and economic growth. But why is a popular Norwegian-based low-fare airline in the firing line? Newspaper Dagens Næringsliv (DN) pointed to the higher risk the airline has because of its decision to base a large part of its traffic at London’s Gatwick Airport. 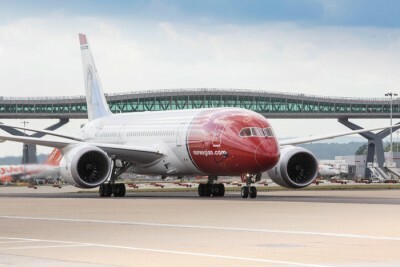 With the British pound collapsing, there also are concerns that Norwegian Air’s costs will be higher in other currencies, while economic growth forecasts have been cut considerably after 52 percent of the country’s voters cast ballots against maintaining membership in the EU. DN also noted that the airline industry expects increased regulartory complexity when Great Britain leaves the EU. Citi analysts think British customers will make up at least 15 percent of Norwegian’s total revenues by 2017. A much larger portion of revenues will be in weak British pounds, while costs will be higher.